Instructors can benefit from creating ESL gerund games to help students understand the concept of the gerund in an entertaining way. When making grammar exercises into games, students don't have time to dwell on the fact that they're actually learning grammar strategies. YourDictionary has taken the work out of finding other online ESL gerund game resources. The following links are excellent online resources for students to practice identifying gerunds. All of the links are associated with college and university language programs and contain credible and accurate information. The Tongue Untied: This excellent website from the University of Oregon's guide to grammar, punctuation, and style offers several quizzes on gerunds, participles, and infinitives. These quizzes are designed to be printed out and administered in class where they could easily be turned into games. A Guide to Learning English: The Frankfurt International School maintains this excellent gerund, participle, and infinitive quiz that can be taken and scored online. Grammar-Quizzes: The College of San Mateo maintains this grammar check site that has information, worksheets and quizzes which focus on gerunds. Forming Gerunds: Bergen Community College maintains this very useful website that has easy-to-understand instructional ideas and online exercises to practice gerund comprehension. If you ask your students whether they'd like to take a quiz or play a game, they would probably choose to play a game. When you think about it, however, a game is just a quiz without the negative stigma attached to it. It will make it much easier to engage students in the material if they are actively committed to playing the game and winning whatever reward is being offered. Your students will be internalizing the material while they play. When it comes time to test their understanding of gerunds in a more traditional quiz, they will be more confident and better prepared to succeed. Don't forget to reward those who excel in the games. Offer prizes that work within the natural structure of your classroom. For example, students could compete for extra credit points, raffle tickets for a future drawing, snacks, bonus free time, or longer recesses. Skiing is something I like to do. Running can be excellent exercise. I told him I liked his singing. In these sentences, the italicized words are the gerunds. 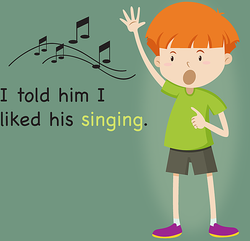 In this example, the word dancing is a gerund because it is the subject of the sentence. In the sentence, the gerund dancing is functioning as the direct object of the sentence. Dancing a jig is fun and healthy. Dancing in this example is a verb in the clause dancing a jig, but the overall clause is a noun phrase that functions as the subject of the sentence as a whole. I love leaving work early. In this sentence, leaving is a verb in the clause leaving work early, but in the overall sentence leaving work early is the object of the subject I and the predicate love. "ESL Gerund Games." YourDictionary, n.d. Web. 21 April 2019. <https://esl.yourdictionary.com/lesson-plans/esl-gerund-games.html>.